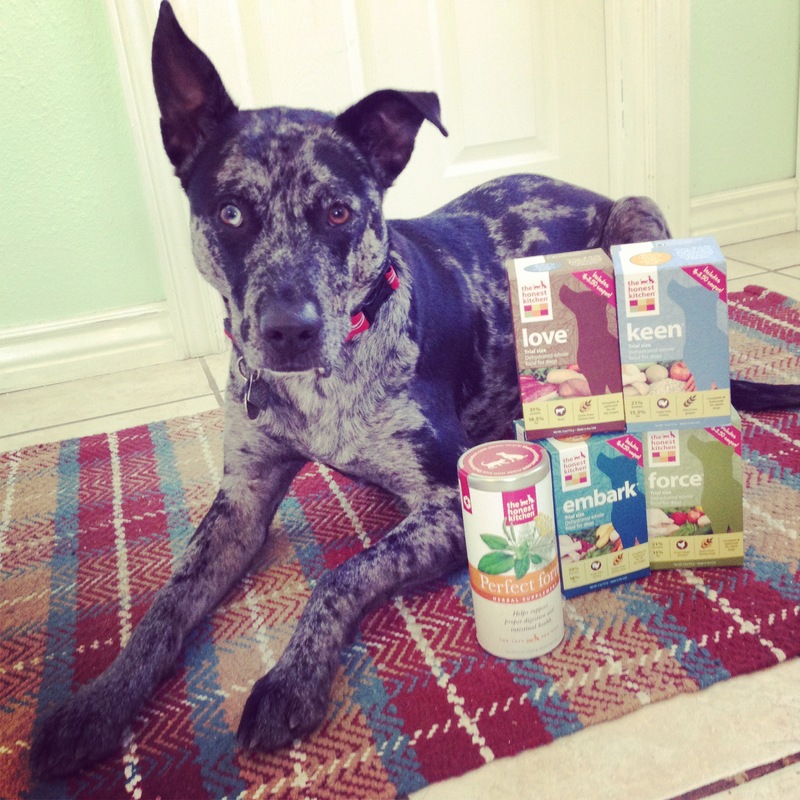 Recently, Asher recieved a wonderful sample package from The Honest Kitchen; Keen, Love, Force and Embark dehydrated foods. And the Perfect Form Supplement for digestive health. We also got booklets on their complete line of foods, treats, teas, and supplements; ways to feed to a healthy pet, and a booklet about The Honest Kitchen and the origins of the company. The Honest Kitchen was started by Lucy when she wanted to find a more convenient way to prepare raw foods for her dogs. The plant where the foods are produced is a “human food plant” and is regulated by the FDA. The produce and ingredients are certified organic, GMO-free and free range, antibiotic free, hormone free or wild caught. Although only 64% of the ingrediants come from the US all others conform to the US food safety standards and nothing comes from China. 🙂 And all processing occurs here in North America. They are an approved member of the Green America (formerly Co-op America) and they are one of four Pet Food companies to receive a ‘four leaf’ rating from Greenopia. (Go check out the Greenopia website to see where your current food company ranks) And even though, we didn’t receive any in our package they also make cat food in dehydrated form and gourmet treats(for dogs and cats)! A full meal for asher would be a full cup of food 2 times a day. Since I don’t plan on switching him 100% to this food, I have simply been using it as a topper; one tablespoon, re hydrated on top of his kibble. The box lasts longer for me this way and I feel he is getting added nutrients that his Dry Kibble simply cannot provide. The Force food, actually smelled of veggies and chicken when I added water to it. And there are grain free options! I have found Asher simply cannot processes bad grains, cheap grains. And I am certain this is what causes his gas problem. After adding the Honest Kitchen Food on his own kibble for just a week, I have noticed his gas is nearly gone. I also believe this to be a result of removing crappy kibble from his diet. He is also a bit more eager to eat breakfast than normal, mind you Asher prefers his first meal between 10 am and 12 pm. Thankfully our local Pet Boutique here in Colorado Springs, Republic of Paws, carries The Honest Kitchen Foods and treats! I picked up some of the Icelandic Catfish ‘Beams’ for Asher and he is in LOVE with them! I barely got the bag open and he was doing circles! 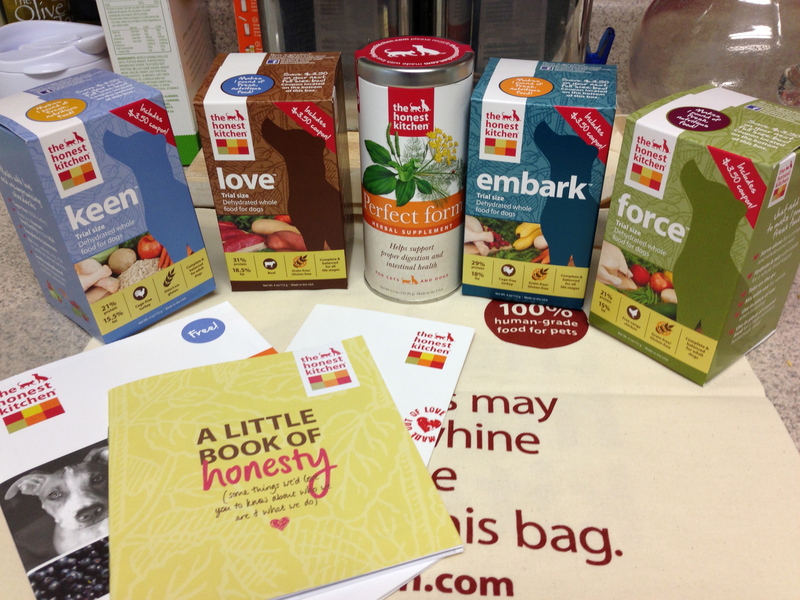 Want to learn more about The Honest Kitchen and their products? Visit their website HERE! Found your review on The Honest Kitchen Blog and I totally agree with you. I had a great experience with my cats Boomer and Rocky with their diets when switched to Prowl. Huge help with their kidney conditions. Now I am introducing my cat Makana to their products and doing the “diet” thing correct from a young age! I help animals and their people understand “queeeezy stomachs” with my animal communications and energetic work. It is amazing when they switch over to non grain and esp. The Honest Kitchen foods…love it! All the best to you and your fur folks!